Dear Rattle With Us members and other friends. Results from the first poll indicate that an informed public will vote against the Snyder Sales Tax proposal. However, uniformed voters support the tax. If you want a responsible road funding plan that doesn’t increase our sales tax by 16.7% then it is up to you to start informing your friends and neighbors. Absentee ballots for the May 5 vote will likely be mailed out two months from now, in early April. Write a letter to the editor and we’ll post it on our website. Russ Spencer of Tyrone Township wrote a letter opposing the sales tax increase. His letter was published in the Sunday edition of the Livingston Daily and we posted a link to his letter on our website. By writing his letter, Mr. Spencer informs thousands of readers about the details of the Snyder Tax. Everyone who is acquainted with the auto industry and most of the private sector knows that hard times lead to reduced revenues. When that happens, all department managers are required to use their creativity and courage to find ways to reduce spending to correct for that. In my career, I have been required to make several 5 percent to 10 percent painful departmental cuts for up to three years in a row. I once complained and was assured "you are not being required to work harder, only smarter." The state of Michigan has a $52 billion budget and needs $1.2 billion to fix roads. If all departments were required to trim by a paltry one-time 2 percent, the problem would be solved. Instead we are faced with a typical public sector solution; increase the sales tax by 17 percent! Now the state budgeting bureaucrats have underestimated the amount of corporate tax credits and caused a $440 million shortfall. We are told this will be met by cutting services. That's like a car company faced with such difficulties deciding to sell fewer cars. Now is the time for our state bureaucrats to exercise some creativity and courage and do the kind of belt-tightening that people who live in the real world have to. Our movement needs more people like Mr. Spencer! Letters to the Editor reach more people than just those on your email list. Letters to the Editor reach the general population who are likely not as well informed as you, the conservative activist. Please take the time to write your own letter opposing the Snyder Tax. You’ll help influence public opinion and hold Lansing accountable. Here are some talking points to consider including in your letter. NO MORE GENERAL FUNDING TAX INCREASES... Our Roads, like our Schools, need REAL REFORMS not just more money thrown at them and Patrick Colbeck and a few other Legislators are the only ones demanding we look at how and for what we spend our money on to Fix Michigan Roads. Many in Lansing, Government's in general, only solution to anything is a TAX INCREASE! It's time for Government to actually review and FIX AN ACTUAL PROBLEM rather than just throw money at it. The Governor, and far too many Legislators, want to put money into the General Transportation Fund; which would mean more money on Bike Paths, Road Landscaping, and yet more diverted to subsidize Mass-transit also; whereas those I support want more money to go to ONLY FIXING BROKEN ROADS (and not even toward more new Roads), for which the Price-tag is actually far less. Also, the 16.7% increase (from 6 cents to 7 cents, putting MI equal with others at the second highest and slowing/harming Michigan's ComebackState initiatives) does NOT just go to roads; it's a (belated) Christmas tree filled with ornaments to help get more folks to help pass it - even adding 50 Million to the General Fund that Legislators can dream up new things to waste it on! I would vote YES to a half/cent increase if that money was strictly allocated to fixing roads and nothing else, but for May 5 I am a NO VOTE! FIX IT, DON'T DEMAGOGUE IT! When/Where we have to entirely replace Bridges, how about we focus on putting in a "functional" Bridge to deal with Traffic rather than things that seem to focus more on being a Modern Art display!?!? You may, in your letter, want to touch on the fact how we just recently raised the Minimum Wage in Michigan adding costs to businesses and potentially causing inflation as businesses; strapped for cash; have to pass that along in increased pricing. Adding/increasing the Sales Tax, also and on top of that, hurts Michigan's ability to attract people/businesses and keeping Michigan's ComebackState status! DEMAND the Michigan Legislature and Governor use THAT $$$ for the Roads repair funding!!! SHARE A COPY OF YOUR LETTER TO EDITOR HERE ON RWU IN THE COMMENTS SECTION TO HELP INSPIRE OTHERS!!! Governor Snyder has come up with a new hastag: #Blueprint4America, variation/escalation of/from #ComebackState, because he is considering a POTUS run. Sorry Rick, but RAISING TAXES is NOT a Blueprint for Michigan or America. The #Blueprint4America is Scott Walker in Wisconsin who has won 3 elections in 4 years time in a solid Blue (Michigan is still somewhat Purple-ish) State, and has directly taken on the Left at every turn while you cozy up to Democrats! Paul Mitchell @SayNoOnProp1 on "OFF the Record"
Michigan Republican State Chair Candidate says opposing the Tax Increase will help brand the GOP. Click here to Read on Norm's Blog. Norm Hughes told the crowd at the 8th District Pancakes and Politics on Saturday and a group of Patriots today, that "If the Party stands for nothing it will fall for anything". He recalled the Reagan bold colors speech and said to become a majority Party, Republicans must clearly state what the differences are between the Parties and why voters can rely on Republicans to govern in accordance with our principles. "The National and State Republican principles are stated. We believe in less government at the closest possible level to the people. We believe in responsible, efficient, frugal, limited, low tax government. The State budget has gone up seven billion dollars in the past four years. Spending $ 53 billion a year, we can find another billion dollars to fix roads. We can repeal Prevailing Wage Laws, open up bidding to more contractors, get better specifications and warranties, and save about $ 400 million a year." Hughes said Georgia has about 100,000 more people and spends about $11 Billion a year less. "Clearly we can find waste in our state spending. Moreover, the Senate Fiscal Agency projects more General Fund income of about $2.1 Billion over the next three years, and more than $2 Billion in the School Aid Fund. We are not taxed too little. Many are unemployed and underemployed. Taxing families another $500 or $1,000 a family (or more) is not the solution at this time. If we make it a priority we can fix these roads within the tax money available. Hughes said that by a 12:1 ratio Republican precinct delegates are telling him they oppose the May 5 tax proposal. "By a 7:1 ratio they want the Republican Party to oppose the proposal." "With approval by the State Committee and the Delegates, under my leadership, the Michigan Republican Party should ask the legislature to pass a no tax counter proposal to also be on the May 5 ballot, and failing that, the Party might lead a petition drive to meet voters at the polls with a no-tax solution. This will help brand the Party as being resolute in support of our stated principles." Hughes said that the GOP lost thousands of volunteer hours in the last election cycle and needs to bring back conservative volunteers. "With each growth in government we lose a bit of personal freedom. We must stand by our principles, and let our elected leaders know that we want limited government." He's been called the Taxpayer's Hero by the Michigan Taxpayers Association. Former State Representative Tom McMillin is truly a hero for hard-working Michigan citizens. McMillin is now challenging Michigan's Bureau of Election to adopt clear and concise language for the upcoming May 5th ballot proposal, which among other things would increase Michigan's sales tax by 16.7%. But after hearing details of the complex plan, the results gets flipped, with only 38% saying they would vote “yes" and 47% saying they would vote 'no." The poll has a margin of error of plus or minus 4 percentage points. (ROG analysis: Here is evidence that the more people know the less they like the Snyder Tax. We need your help to inform the public if we are going to keep Governor Snyder from dipping into your wallet. Read our analysis and then share it with your friends. Once people understand that a large portion of this tax hike goes for non-road related spending they will likely vote NO. You need to remind people that Lansing needs to fix the roads, not increase welfare payments. There are many organizations lining up in opposition to the Snyder Tax Increase. Concerned Taxpayers of Michigan is working with former State Representative Tom McMillin to help inform voters of the details of the Snyder Tax Increase. 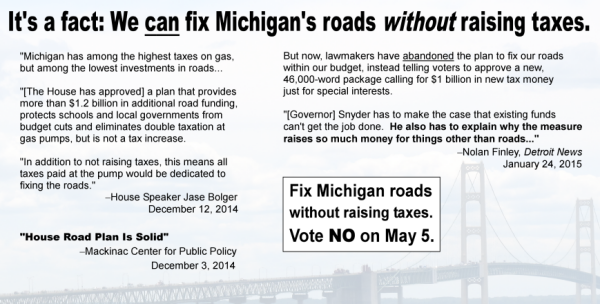 Make no mistake; all of the Snyder Tax Increase is not going to fix our roads. In his letter below, McMillin urges the Bureau of Elections to use ballot language which accurately reflects the scope of this massively complex tax hike. Please share this widely with your friends and neighbors. Then select one point from McMillin’s letter and write a letter to the editor of your local paper. We need you to educate the uninformed public. The evidence is clear, the more people know about this complex tax hike the less likely they are to vote for it. Do I sound like a broken record in urging you to write a letter to the editor? You are darn right! We need patriots who are going to deliver our message to those outside of our movement. Attending TEA Party meetings is not enough to deliver our message to those who need to hear it. Remember, letters to the editor are the third most widely read section of the newspaper. Only the comics and the sports section attract more readers. Send us a copy of your letter and we’ll post it on our website. Now, here is McMillin’s letter to the Bureau of Elections. Thank you for taking the time to review the language proposed below for the May 5 ballot initiative to adopt House Joint Resolution UU of the 97th Legislature. I'm honored to represent Concerned Taxpayers of Michigan, an organization of Michigan citizens who have two concerns with the proposal: the merits of the proposal itself, and the manner in which the proposal is presented to voters. The state legislature passed ten bills, signed into law by the Governor, that, without uncertainty, go into effect if and only if the constitutional amendment is adopted by the voters. Therefore, the ballot proposal not only adopts the constitutional amendment, but puts into effect these ten laws or rejects them as if they were never made. It is obvious that, on general principles of law and reason, when legislation becomes law if and only if approved by a ballot question put to voters, said legislation is the subject of the ballot question. Michigan election law requires that a question "shall be worded so as to apprise the voters of the subject matter of the proposal or issue." It is obvious that, on general principles of law and reason, when a ballot question addresses multiple subjects, voters must be apprised of each and every subject so as to fully understand what it is they are voting for. Any proposed ballot language must therefore apprise voters of the subject of each of the ten laws that will become active if and only if the amendment is approved by the voters. SB 847 (Public Act 469 of 2014), which increases the state Earned Income Tax Credit (3 pages). By the count of 64 pages of fine print, it's clear that even these summaries are a gross oversimplification of ten bills that will or will not become law according the response to the ballot question. And this does not include the amendment itself. Each of these laws was carefully worded to have specific legal meaning that affects all citizens of Michigan. It is the position of Concerned Taxpayers of Michigan that state law requires voters be informed of each and every subject addressed by each of the laws that take effect if and only if the proposal passes, as well as the direct effect of the constitutional amendment itself. State officials have the legal and moral obligation to present a true and complete statement of the proposal's effect to voters. It would be dishonest to put to voters a question to adopt a constitutional amendment without disclosing each of ten additional laws that have been enacted, signed by the governor, and will for a certainty go into effect if and only if the proposal is adopted--some that in fact await the amendment needed to make them constitutional in the first place. It would be especially (and audaciously) dishonest to make no mention that one of these laws replaces a tax repealed by the amendment with a highly similar substitute tax. To lead voters to believe that a tax would be repealed when in fact it would be replaced with a higher tax is deception of the highest degree. Yet that is what was proposed by House Concurrent Resolution Number 39 of 2014, which I urge you to disregard entirely from consideration for ballot language. House Concurrent Resolution Number 39 of 2014 recommends potential ballot language for the Board of State Canvassers to consider. The proposed title reads: " A PROPOSAL TO AMEND THE STATE CONSTITUTION TO ELIMINATE SALES AND USE TAXES ON GASOLINE AND DIESEL FUEL, ALLOW AN INCREASE IN THE SALES TAX RATE, DEDICATE REVENUE FOR SCHOOL AID, REVISE ELIGIBLE SCHOOL AID USES." The title makes no mention of the ten laws that are activated upon passage of the amendment. It makes no mention of PA 468, which replaces the sales and use taxes on gasoline and diesel with a higher wholesale tax, nor PA 467, which in fact raises the state sales tax to the 7% level that would be allowed by the constitutional amendment. It makes no mention of the Earned Income Tax Credit, nor registration taxes, nor competitive bidding on county road projects. The title mentions only the constitutional amendment and the changes it makes to the state constitution. "A PROPOSAL TO AMEND THE STATE CONSTITUTION AND ACTIVATE TEN LAWS THAT WOULD RAISE THE STATE SALES TAX, REPLACE THE RETAIL GAS TAX WITH A WHOLESALE GAS TAX, RAISE AND CHANGE THE NATURE OF VEHICLE REGISTRATION TAXES, INCREASE THE EARNED INCOME TAX CREDIT, DEDICATE CERTAIN TAX REVENUE FOR ROADS AND SCHOOLS, ALLOW COUNTIES TO REQUIRE ROAD COMMISSIONS CONTRACT FOR PROJECTS WITH COMPETITIVE BIDDING IN CERTAIN CONDITIONS, REQUIRE THE DEPARTMENT OF TRANSPORTATION TO GIVE EXTRA ASSISTANCE TO DISADVANTAGED BUSINESSES AND TAKE OTHER STEPS TO STEER MORE STATE-FUNDED ROAD WORK TO SUCH FIRMS, REQUIRE THE DEPARTMENT OF TRANSPORTATION TO DEVELOP A PERFORMANCE-BASED ROAD PROJECT RATING SYSTEM, AND REVISE ELIGIBLE SCHOOL AID USES." Dedicate a portion of use tax revenue for school aid purposes." Once again, numerous laws activated by the proposal are not mentioned. In fact, the only law mentioned is Public Act 474 -- dedicating additional revenue for transportation purposes. Once again, the proposed text notes the elimination of the gas taxes without mentioning that they are replaced with higher taxes to identical effect. To the citizens of Michigan, it's immaterial which tax needed a constitutional amendment to be repealed or levied and which did not. And the state sales tax is said to merely be "allowed" to be raised to from 6% to 7%, as if there was not already a law standing by, awaiting the constitutional authority to be lawful and activated by this very proposal! Appropriate $40 million for reading programs." This would, in 100 words, reasonably represent what the proposal will actually do in a manner understandable to voters. Finally, since it is absurd that legislation should be passed into law without the lawmakers (in this case, the taxpayers) being able to read the legislation in its entirety, voters should be instructed that a complete copies of HJR UU and Public Acts 467 through 476 of 2014 are available at each polling location for their review, and election officials instructed to make such materials available. I urge the Bureau of Elections to adopt ballot language that factually present the voters with all of the major legislative provisions that go into effect if and only if the proposal is adopted by voters. This is the truth the voters need to make an informed decision on May 5th. After recently reading and reviewing the State House Bills 2013 HB 4539, 2014 HB 5477, and the two Bills to amend 1933 PA-167 and PA-51, I appreciate the hard work and thought that went into the Legislative effort to raise more revenue for the roads without raising taxes over a realistic 3 year time frame. It is totally committed to roads and all of the many issues that are involved in road construction, maintenance and safety. This time frame allows for an ongoing review of the process and for effective corrections. One has to read it to appreciate the multitude of services required in road funding beyond the construction of our roads and bridges. These Bills also hold harmless, loss of funds in sales tax revenue committed to schools and local government revenue sharing. In my opinion this is Plan B! Our local media, including WJR talk show hosts in my view, chastised the whole Legislature about waiting late into the “lame duck” session to come to an agreement. However, even though our democratic process is intended to debate and come to a consensus on important public issues, the opposition demands a bipartisan process. Bipartisan is a code word for “to get what you want, you have to give us what we want.” even if not related to the issue at hand. In order to agree to this ill- conceived ballot issue, the special interests of education and public transit were tacked on to help overcome the opposition of the general public to this sales tax scheme in the May Election. Attached [NOTE: Attachment NOT available in this platform] is an issue about “ASR” (Alkali/ Silica Reaction) that may have a negative effect on concrete durability. This should be thoroughly addressed before we engage in what will be a huge undertaking in fixing our road systems. To the best of my knowledge we are still not using best available materials and methods to repair roads, especially pot holes. 2014 - $600M House proposal vs. $1.7B Senate proposal + legislative fairy dust = $2B voter proposal in 2015??? In 2014, a series of road proposals from both the State House and Senate varied in overall amounts (between $600M & $1.7B) and approaches by altering our gas tax rates and modifying the current sales tax allocations to fund such proposals and thus fix our roads. Now, during the 2014 lame duck session and a little bit of legislative fairy dust, the best resolution for our roads from Lansing is in excess of a $2B annual tax? What justifies a permanent 17% sales tax increase (from 6 to 7%) for a temporary road problem? I understand ‘tax at the pump’ in Michigan consists of both a preset gas tax per gallon consumed ($0.19 +/-) and an additional sales tax ($0.06) per dollar spent. With gas price fluctuations recently ranging from $4.00 - $2.00 per gallon, the sales tax received by the State for gasoline is an unknown variable whereas the gas tax in Michigan is more stable/predictable and allocated by law for roads and infrastructure. The sales tax is spent as our State Government deems necessary without many mandatory allocations. With the combination of the gas tax and sales tax in Michigan, it easily ranks us within the top 10 nationally in ‘tax at the pump’ (http://is.gd/R7G22n ). If the permanent sales tax increase is indeed approved from 6% - 7% (generating an est. 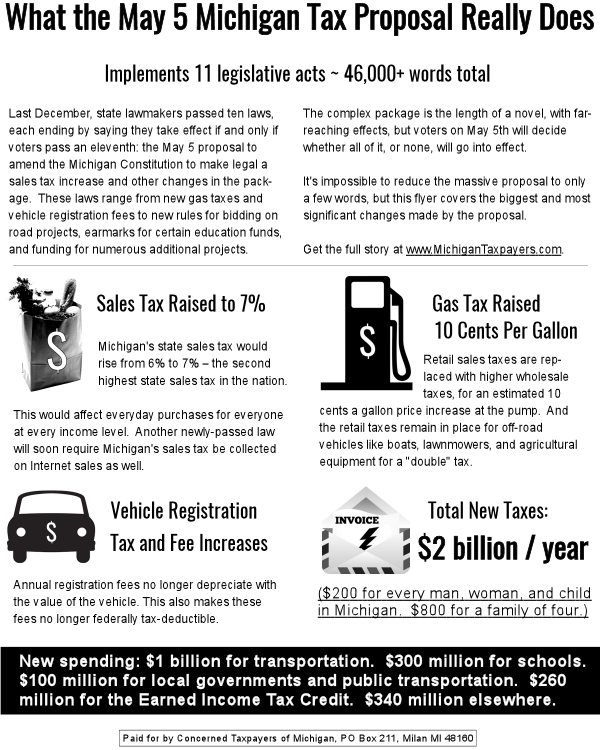 $2B annually) what justifies the need for the continuation of Michigan’s gas tax with all this additional revenue? Has our State Government truly lived within its means in taking care of its core functions? Has this proposal been seized by the Lansing-based ‘Party of Government’ (unelected establishment with backroom deals or special interests in pursuit of profit)? We all demand better roads and pay bounteous taxes (top 10 nationally) to accomplish this. Logic thus argues that its government’s natural task to fix the roads! When does increased taxation help either the economic or population growth of any State/sovereign entity? Does this proposal lead us to a more restrained or a more intrusive government? I suspect the latter and thus implore our representative government to work together in our common effort to not only to reinvent Michigan, but provide and maintain the roads for us all to get there. The “fix” is in. Many in Lansing would have you believe that the only solution to our crumbling roads is to raise taxes. They promote statistics like “Michigan ranks last among the 50 states in per capita road expenditures”. These headlines are designed to lead citizens to the conclusion that we simply don’t pay enough in taxes. Funny thing about the per capita road spending statistic.only the mafia prices out pavement contracts based on the number of bodies. Road construction projects are typically priced out according to the number of miles to be paved. Guess where Michigan ranks when it comes to how many dollars per mile we spend on our roads? 13th. In fact, Michigan spends 53% more per mile than the national average (SOURCE: Reason Foundation, www.reason.org/studies/show/20th-annual-highway-report ). This information would tend to lead citizens to a much different conclusion. Perhaps we have a problem with how we are spending the $3.3B already allocated to transportation? In support of this assertion, we should note that Indiana spends roughly the same amount per mile on their roads. Do you know where they ranked in pavement condition? #1. Do you know where Michigan ranked in the same analysis? 43rd. Clearly, the solution to our transportation infrastructure woes needs to look at much more than tax revenue. If the recent “road solution” would have passed as proposed, we would have been paying $0.44/gallon more at the pump.and that assumes that the price of gas itself remained constant. For every dollar increase in the price of gas, the tax on gas would have increased another $0.07/gallon. If it would have passed we would have been treated to one of the largest tax increases in Michigan history. Furthermore, the increase in the diesel tax from $0.15/gallon to $0.19/gallon would have not only increased the price of fuel for truckers, it would have further increased the price of the goods they transport on our behalf such as groceries. The backup plan to this approach was to put a 1% sales tax increase on the ballot for voters to decide. Once again, the focus was on a tax increase as the “solution”. I am proud to have constituents that are not falling for this false narrative. When we talk about road funding, they ask, “Don’t we already pay the 5th highest gas tax in the country? Why isn’t it going to fix our roads?” Our taxpayers know better. They deserve better solutions. During my rookie term in elected office, I have been working hard to do just that. My road funding plan outlines how to fix our roads without raising taxes. The plan focuses on spending priorities (i.e. appropriations policy), expense reductions, and innovative revenue sources. You can see the plan for yourself at www.SenatorPatrickColbeck.com. Lost in the recent noise from the “tax first” crowd was the observation that the Senate did pass several bills that align quite well with my proposed road funding strategy. We passed two appropriations policy reform bills (SB 6 and SB 149) that ensure that taxes raised for roads go toward roads. Furthermore, we have already allocated $737M more General Fund money toward roads in just the FY14 and FY15 budgets than had been allocated under the previous administration. We have also passed several bills that would reduce road construction expenses (HB 4251, 5460, and 5167). Despite all of this progress, we are still being led to believe by some that the Senate failed to address the “road problem”. Our roads did not crumble in a day. They will not be fixed in a day. Clearly, though, we have done more to fix our roads in the past two months than the previous administration did in eight years. While the majority of us struggled through a long, difficult winter that took a toll on our spirits as well as our roads, some reflected upon how the resulting road “crisis” could be used to justify increased taxes. The only solutions that will satisfy them feature taking more money out of your pockets to put into their pockets. Winter may be over, but be prepared for another snow job this summer as voters are being led to believe that the only “fix” for our crumbling roads features higher taxes. final ballot proposal language "is deceptive"
Today, Rep. McMillin, Chairman of Concerned Taxpayers of Michigan, responded to the final ballot proposal language, approved 3-1 today by the Board of State Canvassers, by stating that the approved language deceives voters. No mention of the affirmative action mandate for road contracts. No mention of the boon to the big empty buses, known as mass transit. No mention that a large portion of the tax increase will go toward doubling the current welfare subsidy for low-income workers. No mention that the effect of the tax hike will mean an extra $2 billion coming out of Michigan citizens' pockets every year or $800 per year for an average Michigan family. "From the taxpayer's perspective, this is a question of policy. Which aspects of the proposal require a constitutional amendment to be lawful is not of significance to the average taxpayer. They are being asked to support or reject an entire package of laws. "There is no [legal] precedent for any one law having less importance than another. No one believes it is easy to describe what all of the laws in this proposal do in under 100 words. But we point out that there is no limit on the number of words in the proposal title, nor the caption. "It's our contention that to give the taxpayers a complete and accurate understanding of the laws that they are voting on, that all of the policies in the proposal should be disclosed." "That would include the mass transit subsidies, that would include affirmative action rules at the Department of Transportation, that includes unrelated issues like reading program funding." Think about this point for a moment: There is no legal precedent for any law being more "important" than another. Every law in the proposed package has a unique bill number and a unique signature of the governor. Why, then, should the ballot language mention the Earned Income Tax Credit, or expansion of competitive bidding for road projects, but not mention affirmative action in road projects or mass transit subsidies? "I was just sworn in to tell the truth, the whole truth, and nothing but the truth. The whole truth is significant, because without presenting the whole truth, you can still mislead." I added that the language should be as accurate as possible and note the Earned Income Tax Credit is being doubled, not merely "increased." At any rate, it was explained to the Board of State Canvassers that they had only two options: approve the proposal language put in front of them, or send it back for changes. Interestingly, though, the Director of Elections allowed for his proposed language to be amended then and there--in one small instance, upon a request by a member of the Board. I commented to a member of the Board, who expressed an interest in making a more significant change (making note of the sales tax hike more prominent), that he should ask the Director if he would approve that change. The Board member declined to make request, but voted against the final ballot language. The language was approved 3-1. No changes were made. A proposal to amend the State Constitution to increase the sales/use tax from 6% to 7% to replace reduced revenue to the School Aid Fund and local units of government caused by the elimination of the sales/use tax on gasoline and diesel fuel for vehicles operating on public roads, and to give effect to laws that provide additional money for roads and other transportation purposes by increasing the gas tax and vehicle registration fees. Eliminate sales / use taxes on gasoline / diesel fuel for vehicles on public roads. Increase portion of use tax dedicated to School Aid Fund (SAF). prohibit use for 4-year colleges / universities. Increase gasoline / diesel fuel tax and adjust annually for inflation, increase vehicle registration fees, and dedicate revenue for roads and other transportation purposes. Expand competitive bidding and warranties for road projects. Increase earned income tax credit. As you can see, the proposal scurrilously lists repealing gas taxes at the top of the list while burying the fact them replaces it with similar taxes way down in the list, and without mentioning that the replacement taxes are higher! Concerned Taxpayers of Michigan made news when we were the first (and only) group to urge the Director of Elections "don't lie to voters." We got ballot language that is less deceptive than the language proposed last year by the lawmakers that put the issue on the ballot. Voters are not going to be given the whole truth, not on the ballot, and we will work to educate and mobilize voters on May 5. If you can, please chip to contribute to this effort. This morning Senator Colbeck was interviewed on Radio Station WJR on the Frank Beckman program about his opposition to the May 5 proposal to raise our sales tax to 7% to increase Road Funding. I believe it worthwhile to hear this interview which is available now at the WJR website, the Frank Beckman Show. During the interview Senator Colbeck covers the need to cover the quality of these repairs and any new construction. The need for transparency to identify those hired to design, repair, construct, monitor and inspect all aspects of this work. He refers the Bolger Plan that passed the House last year accomplish these concerns and to accomplish them without raising taxes and that all revenue generated would to exclusively to the roads. Attached [Editors note: attachment not available via this website] is an article written by Senator Colbeck in 2013 concerning our roads shortly after having been elected. Much thought and work was done during the last session but thwarted by the Democrats and special interests. It's well worth listening too! Senator Patrick Colbeck is very sharp and we should support his idea. It's far better than a tax increase! Representative Gary Glenn [R-Midland] has announced his intention to introduce multiple plans to address Michigan's road conditions in the event that Proposal 1, the proposal to raise $2 billion per year, half for roads and half for various other interests, by increasing the Michigan sales tax to 7% and raising gas and vehicle taxes is defeated on May 5. "The prospects for [Proposal 1's passage] don't look good. The question is, ‘What's Plan B?’ I'm working on Plan B and C, and I know a state senator is working on D, E, and F. So there are other proposals being put forward," Glenn said in a March 5 interview on WCMU's Capitol Report program. The video interview is found on the Web at this link. "Two of the ones that I'm seriously considering are simply to reintroduce two plans that were passed by the House under Republican control in the last legislative session. One would have allocated an additional half billion dollars to new road construction. The other would have allocated $1.2 billion in new road construction, and in both cases without raising raising taxes," Glenn continued. The senator mentioned in the comment is Senator Pat Colbeck. A presentation entitled "Road Funding Plan" is prominently featured on his legislative office website. It discusses four possible options, one being the plan passed last year by the state House. That plan would have allocated $1.2 billion in funds for road and bridge maintenance and preserved funding for schools and local governments without raising taxes. Former Rep. Tom McMillin, Chairman of Concerned Taxpayers of Michigan, applauded the news. "It will be clear to voters that we can fix our roads in Michigan with or without Proposal 1. This exposes the false choice peddled by special interests pushing for the massive tax and spending increases, saying it's either higher taxes or bad roads," McMillin said. "The fact is, the House passed a plan to fix Michigan's roads without raising taxes last year. The legislature can act now to fix our roads, without waiting until May 5, and they can fix our roads without raising taxes. "It is untenable for the legislature to sit on their hands until May and go back to the drawing board only after voters reject massive tax hikes on the ballot. Concerned Taxpayers of Michigan applauds Rep. Glenn and Sen. Colbeck for their leadership on this issue," McMillin concluded. The Lansing politicians who voted last November to put the May 5 proposal to raise the state sales, gas, and vehicle taxes and activate a plethora of unrelated laws are hard to find these days. Apparently they're being confronted by more angry voters than they were expecting. Some have gone into hiding. Others are repenting. But some of them are sticking to their guns, and in defending the indefensible, saying what they only wish is the truth. Here are some of the most common myths, misstatements, and misdirection ploys by the politicians pushing for the May 5 tax increases. Keep a copy of this email handy in case you run into a politician peddling these put-ons. Myth: "We need to pass Proposal 1 because we can't wait any longer to fix the roads." Fact: Proposal 1 stalled any solution to fix the roads, and the legislature continues to stall fixing the roads. Nothing in the May proposal fixes the roads that couldn't be passed now, next week, or a month ago. The legislature could have passed a road funding plan instead of passing the ballot proposal last December, and they could pass a road funding plan today. In fact--and this will amaze you--nothing in the constitutional amendment Proposal 1 would adopt provides any road funding at all! That's right--the funding for roads is contained within the package of ten laws, passed concurrently with the proposal, that don't take effect unless the proposal passes. But those are not part of the constitutional amendment, and could be repealed, modified, or enacted unconditionally. The state legislature could, at any time, repeal those laws. It could amend them. Those that aren't awaiting for the constitutional amendment to be lawful could be passed right now. The legislature could pass last year's House-approved plan to fund roads without raising taxes, without any constitutional amendment, if they were moved to. Proposal 1 did nothing but postpone any solution for nearly five months. And the legislature could act tomorrow to fix the roads. Myth: There is no "Plan B" to fix the roads if Proposal 1 fails. Fact: There's Plan B, C, D, and more in the works. This myth expects us to accept that every lawmaker has placed all of his or her eggs into the Proposal 1 basket. This is, first of all, completely untenable. We are actually being told to believe that lawmakers are just standing idly with no plan in the certainly possible, perhaps even likely event that the proposal is rejected by voters. Could any legislator (or governor) seriously look a constituent in the eye and say, "I've placed my complete faith in voters approving the May 5 tax increases, and if they don't, we have no idea what we'll do about the situation?" Can it be that not one of 148 state legislators would think to be constructive and proactive and come up with a plan to fund roads if the constitutional amendment on the ballot is rejected? It cannot. The myth is not only untenable, but incredible. Senator Pat Colbeck, for example, has a "Road Funding Plan" prominently displayed on the home page of his website. It describes four possible plans. One of those plans was adopted by the state House last year. And Rep. Gary Glenn has announced he will introduce alternative proposals, saying he is "seriously considering" reintroducing the last year's plan in the House to raise $1.2 billion in funding for roads without raising any taxes. There will be a Plan B, C, D, and E before May 5. Count on it. Myth: "This proposal is necessary make certain that money collected from gas taxes will go to roads." Fact: There are countless legislative workarounds to accomplish this without amending the state Constitution, and none of the other laws tie-barred to the May 5 proposal are necessary if this is the goal. It's an important fact that Michigan pays the highest gas taxes for among the least road funding, because this explains why are roads are in such bad shape despite such high gas taxes. But it's utterly false that the only way to spend the amount of revenue raised by gas taxes on roads is to raise gas taxes or any other tax. It can be accomplished simply by marking that level of revenue for roads, and not spending it elsewhere. Want all the top politicians' lines debunked? See below. I'm attaching this separately because it gets a little personal at the end, but if you're looking for arrows in your rhetorical quiver for debating the proposal pushers, please read on. Stay tuned for more myth-busting on the Michigan Tax Hike Proposal, brought to you by Concerned Taxpayers of Michigan. Thanks for reading, and remember to vote "NO" to massive tax hikes for special interests on May 5. 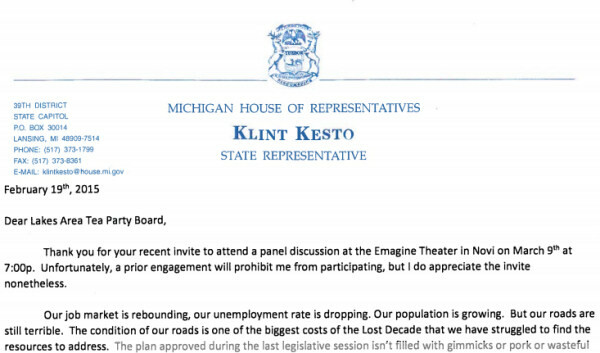 Let's look at a recent letter from Rep. Klint Kesto, who voted for the May 5 tax hike proposal and will not attend a large event in his district discussing the proposal. This is a half-hearted attempt to pass the buck. It's been over four years since Jennifer Granholm and the Democrats were in power, but according to Rep. Kesto, it's their fault the roads were so bad in the first place, and despite heroically "struggling" to find resources for roads, in four years Republicans were unable to find a solution. The fact is, House Republicans passed a road funding plan last year that would have fixed roads without raising taxes. The Senate responded by passing a plan that would have raised taxes by $1.2 billion. Lawmakers could have supported the House plan, which was superior, or they could have even compromised and raised taxes by half the amount proposed by the Senate. They could have adjourned and picked up where they left off the next month, January 2015. Instead, at the last minute of session in 2014, they punted the issue to voters with a $2 billion tax increase on the May 5 ballot. That was their decision, and nobody else's. The plan approved during the last legislative session includes $260 million in wealth redistribution--the "Earned Income Tax Credit"--it includes money for the "School Aid Fund" that is paying for the new Red Wings arena, and it frees up $340 million in the general fund to go wherever lawmakers please. The average person would therefore name the above statement a falsehood. But I'm sure it wasn't lost on attorney Kesto that "gimmicks," "pork," and "waste" are all subject to interpretation. It is, however, quite a fib to say that the new tax money would "direct revenue precisely to our local and state roads," when only half of the money is even going in that direction. Only a legislator would consider ongoing relationships with lobbyists and colleagues "years of work." The public never asked for tax increases. The public only asked for roads to be repaired. It was the legislature that insisted on tax increases. The proposal was negotiated in the final hours of last year's session, with no input from the public, and the proposal was a complete surprise to the public and to the media. What Kesto really means is that the Republican legislature cut deals with the Democrats for their support and threw in enough incentives for various interests to put their skin in the game ($300 million for schools, $100 million for local governments). This is misleading, since the entire proposal pushed back any possible action until May, when the legislature could have enacted legislation last year, or even last month, or any other time to fix the roads. This is also a veiled threat that if the proposal isn't passed, road repairs could be set back as much as another entire year. This is another another intentionally misleading point, prominently peddled by the tax proposal's pushers. What matters to taxpayers is how much tax is collected, how it is collected, and how funds are ultimately distributed--not how they swirl around in Lansing for any number of legal or political reasons. And besides, the plan the House passed last year would have committed money from gas taxes for roads, without raising taxes and without amending the state constitution, by simply replacing retail gas taxes with wholesale taxes. One of the most important political calculations in having the voters decide Proposal 1 was the thinking that if the proposal was adopted, the public would mistakenly pardon the politicians for putting it on the ballot in the first place because they were only doing what "the people" wanted. The truth is,the elected officials that voted for the proposal expected they were setting a situation in motion where the interests that would profit so handsomely from the proposal's passage would take care of getting voters to pass the plan. We here at Concerned Taxpayers of Michigan hope to prove their predictions wrong. But if they win. the politicians will claim that the voters are entirely responsible for the outcome, when in fact they were the ones who created the surrounding circumstances. In essence the entire proposal is an exercise in passing the buck. Rep. Kesto has the temerity to call putting tax hikes to voters "empowering." The Republican Party Platform of 2012 states: "Taxes, by their very nature, reduce a citizen’s freedom." By Kesto's tortured logic, voters are being empowered to reduce their own freedom. Kesto falsely states that the proposal would increase the sales tax by "one percent." Surely Rep. Kesto, an attorney and politician, knows the difference between one percent and one percentage point. The sales tax increase from 6% to 7% is a 16.7% increase. And besides being a condescending explanation of why we all use roads, notice this raises the question of why, when gas tax money is being put to roads, we still need so much more sales tax money for roads, too. ...Which is why voters should be furious that lawmakers, instead of fixing our roads, are demanding voters approve tax increases if they want them fixed, essentially holding our roads and people's lives hostage to these tax increases. This is another angle on the false choice between higher taxes or bad roads. The subtext is, "you're going to pay one way or another, but it'll be easier for you just to pay us." It's more shake-down rhetoric, dressed up as an economic calculation. And again, the fact the House proved last year they can fund road repairs without raising taxes shows this for what it is: a shake-down. This is the most egregious example of passing the buck in a letter that has done this several times already. The two plans in 2014 to fund roads without raising taxes "did not clear the necessary Lansing hurdles" because the House buckled and voted to put Proposal 1 on the ballot! In vague words written the passive voice, Kesto bemoans that "how we got there was the subject of much debate" and "there was much disagreement." Right. There were principled leaders who stood strong--Senator Jack Brandenburg, who tweeted today that he will vote No on the May 5 tax proposal, and voted against putting it on the ballot last December--comes to mind. This is another technique to pass the buck to voters. Anything forbidden by the state constitution, the legislature is "constitutionally bound to let the voters decide." Why doesn't Rep. Kesto support letting the voters decide on removing every other limitation on legislative power, if that's the standard he sets for supporting such measures? Also, the proposal allocates no more than a billion dollars annually to improve Michigan roads when the $340 million redirected out of the general fund since 2014 is taken into consideration. That's nice, but a distraction. Minor transparency details on project bidding is of little interest to voters who are facing a $2 billion tax increase. Besides the first sentence being badly ungrammatical, it's also illogical. The vehicle registration fee increases will affect all vehicles, not just electric ones. And even if the statement wasn't completely wrong, it's a warped view that holds that electric vehicle owners are some kind of tax-dodgers whose loophole needs to be closed. As if energy isn't taxed already! Regulatory reform is an unrelated issue. Kesto is grasping for reasons for voters to pardon him for the "disagreement" on the tax hike proposal. Yet he makes no effort to point out any particular accomplishment he's responsible for, when it was the entire Republican caucus as a body that worked to roll back these regulations. He takes credit for everybody's work. Another attempt to score Brownie points. The "How To Appeal Your Property Tax" presentation is a standby to give constituents a show. Representative Kesto, hear me now: your constituents are your boss, not your spouse. You have no standing to demand we "compromise" by giving you a pass for voting for massive tax increases. You do not get any chips for not voting to control and diminish our lives on other issues, that you can cash in as "compromise" on massive tax increases. After a pack of lies, misdirections, distortions, distractions, and excuses, you close by comparing your relationship to your constituents with a marriage. I sincerely hope, Rep. Kesto, you treat your family with greater respect than you treat your constituents here. You were signed up for this list via MichiganTaxpayers.com, opposing tax hike schemes in Michigan.